Barrington Orthopedic Specialists Providers Sean E. Jereb, M.D. Dr. Sean E. Jereb is a board-certified, fellowship-trained orthopedic surgeon who specializes in sports medicine, arthroscopy of the shoulder and knee, and knee joint replacement. He has been with Barrington Orthopedic Specialists since 2003, serving patients out of the practice’s Schaumburg, Elk Grove Village, and Bartlett, Illinois offices. 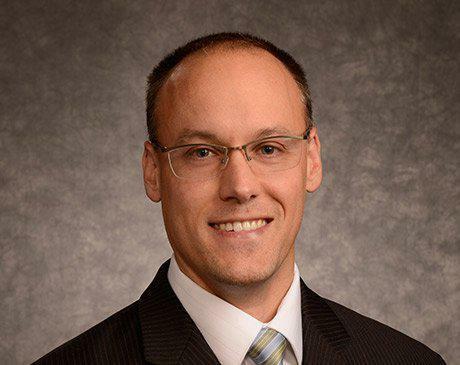 A native of nearby Carpentersville, Illinois, Dr. Jereb enjoys practicing professionally in his home state and serving the healthcare needs of a local community he knows so well. During his time at Barrington Orthopedic Specialists, Dr. Jereb has formed close relationships with patients both in and out of the office. He completed his undergraduate degree at the University of Illinois in Urbana-Champaign and earned his medical degree from Loyola University Chicago Stritch School of Medicine in Maywood, Illinois. He completed a general surgery internship and orthopedic surgery residency at the Northwestern University Feinberg School of Medicine in Chicago and then went on to complete additional fellowship training in sports medicine at Baylor College of Medicine in Houston, Texas in which he assisted in the care of the Houston Texans, Houston Rockets and Houston Astros. He is the team physician for Hoffman Estates High School and is committed to the care of athletes of all ages. Outside of the office, Dr. Jereb enjoys skiing, working out, and spending time with his family. 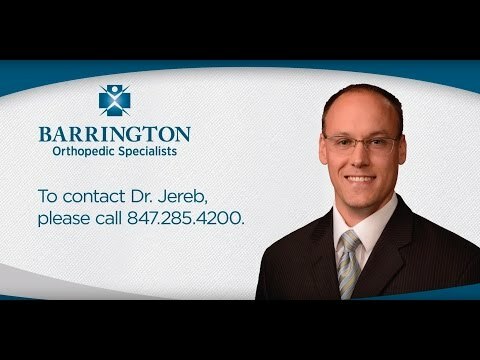 Call Barrington Orthopedic Specialists today or book an appointment online to schedule a consultation with Dr. Jereb. "Dr. Jereb repaired my bicep tendor a couple years ago. Recently when I injured my arm my first choice was Dr. Jereb at Barrington Orthopedic Specialists. The staff is friendly and knowledgeable and I highly recommend them." "Twisted my knee to the point where I could not put weight on it Dr. Jereb was very understanding. He advise me of my options including surgery as a last resort I went with a cortisone shot & he advised me of the pros & cons of its affect Dr Jereb is very understanding & helpful"
"Kind, polite doctor who is willing to sit down and listen. Takes the time to explain the anatomy and disorder! Very positive experience!" "Dr. Jereb is kind and caring. I never feel rushed when at a visit and he always gave plenty of time to ask questions. He is a good surgeon with good outcomes. I have recommend him to my friends and family and they have been happy with him as well. Thank you for excellent care." "Dr. Jereb was very informative and enlightening in his explanation of my situation after the MRI. He recommended physical therapy to enable me to evaluate my need for surgery. I have done many weeks of therapy and combined with my at home work, I have experienced significant improvement in my movement." "Not being able to control the pain in my knee, I made an appointment with Dr. Jereb (who treated my husband successfully in the past). When x-rays didn't reveal the problem, he ordered an MRI, which showed meniscus fraying along with arthritis and a bakers cyst. No need for surgery, only physical therapy! Dr. Jereb's kindness and gentle manner, as well as his professional explanations, put me at ease with this problem. Months later and the knee is so much better! I have also had good luck with other doctors at Barrington Orthopedics Specialists in the past – Dr. R. Rabinowitz and Dr. Brooke Belcher – with lower back issues. They, also, were very helpful." "I came in a year ago to the date after I was injured in a motorcycle accident. I dislocated my left elbow and tore my ACL/MCL in my left knee. I am a runner and a triathlete so this injury was very challenging for me to deal with. Dr. Jareb told me I would need surgery but would have to rehab my left elbow first as it was immobilized. I did 3 weeks of rehab to get my elbow strong enough to use crutches and had my surgery on November 15th. My PT started very quickly after with Kaitlyn. She was great because she was also a runner and knew how much I wanted to get back to running etc. I went to rehab 3 times per week and did things on my own to get back sooner. I was running again at the end of February, did my first post-injury Triathlon in July and placed 3rd in my division and just did a half marathon, the same one I did the day before my accident last year. I have to say that Dr. Jareb and Kaitlyn were both great because they didn't hold me back. They worked with me to understand what my physical limitations were and weren't' and allowed me to get back to doing all the things I love to do! The accident was very traumatic for me and they helped me get through it. Thanks!" "I had an appointment with Dr. Jereb on October 16th for my right knee. Dr. Jereb was on time. I did not wait long in the waiting room and the staff was very pleasant and professional. Dr. Jereb recommended I get an MRI, and I agreed. I filled out a short questionnaire and then went home. About an hour later, I got a call to schedule my MRI that very same afternoon. Terrific! Dr. Jereb is a great doctor. He is one who actually sits down and explains everything completely in words you can actually understand." "Had rotator cuff surgery and everything went very well. Dr. Jereb was very knowledgeable and competent. My visits to the office went well. My shoulder is so much better." "Dr. Jereb did such a good job repairing my torn bicep, I asked him to do a partial knee replacement as well. Both turned out great, and I am back to work full blast as a photographer carrying and lifting a lot of equipment almost every day. Hopefully I won't need any more surgery, but if I do I will definitely be back to Barrington Orthopedic Specialists." "He's the best! Has seen two of my athlete daughters. He's kind, warm and patient. 5 stars!" "Dr. Jereb, was awesome. Very nice caring and easy to get along with. Liz, Jaclyn, Brittany David were the best therapist I have ever had. Very caring and considerate. Had knee surgery back in early March and everyone did such a great job, I am very impressed." "We had the best experience here. My daughter had a previous surgery somewhere else...and the front desk staff there and doctor were not very patient or friendly. On the contrary, your front desk staff always greets you with a smile! Dr. Jereb is an amazing doctor. He is patient with the patient and family. He explains everything in detail. He is positive but honest. He did a reconstructive shoulder surgery on her and the overall experience was a 100+!!" "Dr. Jereb is a very good doctor. He's personable, kind and really cares about making you feel better. I have recommended him to all of my friends and family. He's a keeper!!" "I developed 'frozen shoulder'. I experienced excruciating pain just doing daily activities and sleeping was becoming impossible. I normally play volleyball or wallyball several nights a week and was unable to continue. I'm in my 50's and was afraid that my days of playing sports were over. Dr. Jereb had treated my husband and me for several sports injuries over the years. I went to see him but with little hope. He treated me and put me on a physical therapy regimen. It took a few months of therapy but I am now back to all my normal activities, including sports, and having a great time. Dr. Jereb returned my life to normal. He did it with a smile and professionalism that is hard to come by these days. I'm sure I'll be visiting him with some other malady at some point in the future and know that he will help me get past it. Thanks, Dr. Jereb!" "Last spring, I saw Dr. Jereb for terrible knee pain. I had a feeling I tore my meniscus. I cannot have MRI's due to an metal implant. Dr. Jereb was so kind. He listened to my symptoms. When he looked at my knee and it hurt, he was very sympathetic. I ended up having knee surgery to repair the meniscus and flaking cartiledge. Dr. Jereb explained everything in great detail, including my recovery. Post surgery, he was detailed and kind. His bedside matter is fantastic. He actually cares about his patients." "I had a work related injury and went to see Dr. Jereb as my second opinion. After meeting with Dr. Jereb and hearing what he offered as my operation procedure (right rotator cuff tear), I decided that I wanted him to do the surgery. On August 22, 2006, I was operated on as an out-patient at Alexian Brothers. The operation went very well and I then had therapy both at home and at Northwest Community Hospital, which is close to my home. I was back at work after 2 months and have never had any problems to warrant another visit for that problem. Thanks to Dr. Jereb, I am able to use my hand and shoulder and never had any other problems relating to this." "I came to Dr. Sean Jereb because I fractured my wrist on the weekend after a cycling accident in the summer. I was so thankful that he was at a location close by and could see me early that Monday morning because I was in a lot of pain. He and the staff were very kind and considerate as x-rays were done. My whole arm had to be wrapped in a cast for 2 weeks to better stabilize the wrist. I returned 2 weeks later for new x-rays to check on the healing and to have a below the elbow cast put on. I appreciated Dr. Jereb's clear explanation of the x-rays and processes. 2 and 1/2 weeks later, I returned for the cast removal and more x-rays that showed the wrist was healed. He explained that I would need physical therapy to strengthen the muscles that had weakened from being in the cast and to restore my wrist flexibility. He wrote me a prescription for the therapy, which I wanted to take to a therapist I was currently seeing for my back. I went for physical therapy 3 times a week for 4 weeks and followed up with Dr. Jereb who felt I needed just 4 more weeks at 2 times a week. After that time, Dr. Jereb checked my wrist strength and flexibility and released me from his care. I am very pleased with the care he and all the staff gave me at Barrington Orthopedic Specialists." "My experiences with all the personnel including doctors and therapists have been extremely warm and friendly. They all are concerned about your physical health and have been successful with all my visits. I keep breaking and you folks just keep putting me back together. I am extremely satisfied with all your services and results so much that my wife and I always refer your office to our friends, fellow workers, and family. Actually, I should get discounts for all the folks we sent your way. ;-) I should get flyer miles as often as I had been a faithful patient of yours. All joking aside, I have one more knee replacement to go and will be back around the end of 2014. Then Humpty Dumpty will be put all together again. Thank You! I will be forever a faithful Barrington Orthopedic Specialists (patient) customer." "Dr. Jereb is a kind man. He takes time explaining to you everything that takes place in your joints and how we can work to improve their function. I highly recommend him to friends and colleagues . I will continue as a patient of his as long as needed." "Unfornately, my story starts with an accidental fall in my own backyard then follows the surgery procedure of repairing a left knee – 100% torn ACL with allo-graft, lateral, and medial meniscus repair. As a practicing RN for the past 30 years in ortho/neuro, ICU, and case management, I thought I had a pretty good idea of what to expect. Boy was I wrong. To start off, the Bartlett physical therapists were my rock and hard plate both physically & emotionally. Brad was my savior when we contracted a DME company for a splint. Their account manager was not only rude and unprofessional, but put undue pressure and stress on me to do the leg work. Brad could tell I was frustrated and the whole process was confusing. So Brad contracted a more reliable company and I was able to get the required leg splint needed to obtain the full flexion of my knee and leg that I was lacking. My therapists, Brad, Mike, and Karen, were outstanding and awesome. They coordinated notes and collabratively came up with attainable goals that I was able to reach towards the end of my therapy. The whole experience from walking into the Bartlett location, scheduling appointments with the receptionists, and completing my therapy was a genuine caring experience displayed by everyone. The physical therapy techs were always caring and kind. They all made this experience as painless as possibly. Their geniune reassuring, supporting, and professionalism helped me get back to all my ADL's. Outstanding staff & BIG KUDOS to all of the staff at Barrington Orthopedic Specialists! Thank you so my much. They all deserve praise for a great job done." Dr. Sean E. Jereb is a fellowship-trained orthopedic doctor who specializes in ankle, elbow, hip, joint replacement, knee, shoulder, sports medicine, and wrist. He joined Barrington Orthopedic Specialists in 2003.